Anti-corporate forces are gaining strength, and so supportive politicians need to be ready to fight back. The thing I don’t understand, with all the finger-pointing that’s gone on since the announcement Thursday that Amazon.com Inc. was abandoning its plans to set up shop in New York City, is why so many of the fingers have been pointed at the least culpable party — i.e. Amazon itself. Yes, the $3 billion in tax incentives the state and city dangled to lure Amazon to Queens was absurdly rich — and probably unjustified. But Amazon didn’t hold a gun to anyone’s head. There were 237 other cities offering their own unjustified tax breaks in the hope of landing the company. Indeed, compared to the insane deal Wisconsin gave Foxconn Technology Group, Amazon came cheap. Amazon said its “HQ2” would create 25,000 jobs directly, and as many as 15,000 indirectly. The average pay for an Amazon New York City employee was going to be over $100,000. Even the janitors were likely to be well paid; I’m reliably told there was a decent chance they’d be union jobs. After Amazon pulled out, there was a lot of boasting about all the jobs New York City has added without any tax giveaways (750,000 in the last decade, tweeted Nicole Gelinas, a senior fellow at the Manhattan Institute). The implication was that New York’s job-creation machine was so powerful it didn’t need those stinkin’ Amazon jobs. But a new job created on Wall Street or “Silicon Alley” isn’t much help to a resident of Queensbridge Houses. Yet ever since the deal was announced in November, Amazon has been cast as the bad guy. It was arrogant, critics of the deal said. Greedy. Corporatist (whatever that means). The $3 billion in tax breaks gnawed at the critics. 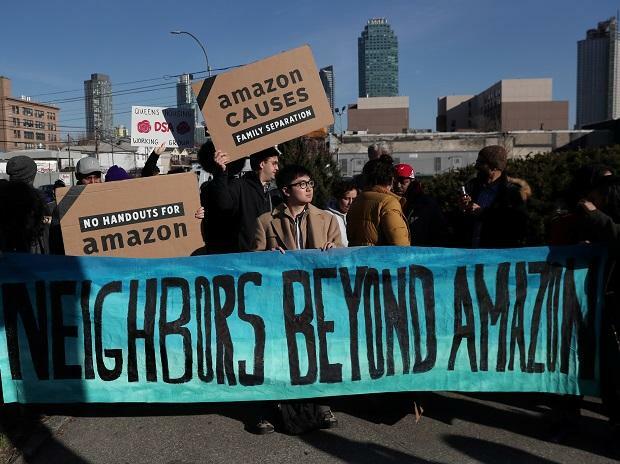 “We got played,” complained city council Speaker Corey Johnson, as he and other council members berated several Amazon executives during a contentious hearing. They didn’t defend the tax breaks as necessary to bring good jobs to a poor neighborhood. They didn’t make hay with a Siena College Research Institute poll conducted in early February showing overwhelming local support for the Amazon deal. Cuomo is supposed to be a skilled and wily backroom pol. Yet he was unable to prevent the appointment of Gianaris to a board that had to approve the deal. Gianaris’s new role gave Amazon reason to believe that its deal might not be ultimately approved. That uncertainty was intolerable, as it would be for any company. Most important, neither the mayor nor the governor anticipated the backlash. Thus they were utterly unprepared when it arrived. In addition to making a loud, sustained case that this was a once-in-a-lifetime opportunity for New York City, they should have put forth some tangible goodies designed to help the community. Like what, you ask? One suggestion I heard was that Cuomo and de Blasio should have maneuvered to create a City University of New York computer science college in Long Island City — perhaps right on the Amazon campus. That would have sent the message that local residents were not going to be consigned forever to Amazon’s lowest-paying jobs. Smart, ambitious kids living in Queensbridge Houses would have a path to something better — right in the neighborhood. The city could have announced that it was setting up pools of money for infrastructure improvements and job training. There were lots of things Cuomo and de Blasio could have done. But they couldn’t be bothered. Now that Amazon has fled, the city and state are going to face a different kind of backlash: from the people who were counting on getting those jobs. Late Thursday night, I got a call from Billy Robinson, a community activist who lives in Queensbridge Houses. He was furious. He knew that residents weren’t going to get many of the highest-paying Amazon jobs. But they were going to get more jobs than they had now. Although what happened with Amazon in New York City was a first, it’s not going to be the last. The left has become increasingly anti-corporation, with billionaire founders like Amazon’s Jeff Bezos serving as a proxy for everything they view as wrong with wealth distribution in the U.S. And as companies — like Foxconn — go back on their word after landing rich government subsidies, those subsidies have become a target of corporate critics like Ocasio-Cortez. Among many other things, Amazon was blamed for failing to engage with the community and disarming the critics. But that wasn’t Amazon’s job. That was what de Blasio and Cuomo were supposed to do. They utterly failed. Given the mood of the country, government leaders using tax incentives to land corporate facilities will need to roll up their sleeves and sell the deal to the public. Being able to trumpet significant job creation was once enough to justify government deal-making with a corporation. But it’s not anymore. Amazon did nothing of the sort. De Blasio threw the opportunity away. Cuomo threw the opportunity away. That should be the lesson for any city or state official hoping to land a corporate expansion for the foreseeable future. Too bad New York couldn’t have learned it a few months earlier.